Happy New Year! At the end of each year, I try to come up with a new black-eyed pea recipe so that I can start the year off with the Southern tradition of black-eyed peas and greens. Since I don’t want to be too traditional, I try to create something a little different each time. 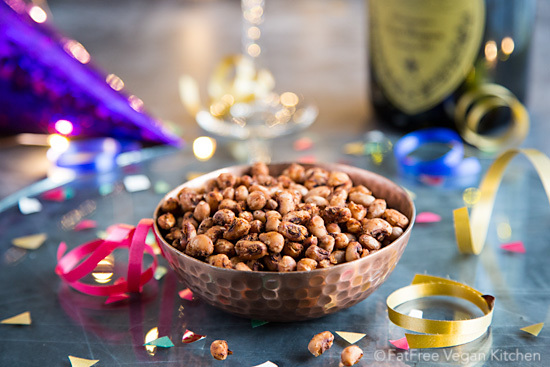 This year I decided to really shake things up by using one of my new gadgets, a Phillips Air Fryer, to make a crispy black-eyed pea snack that would fit in at a New Year’s Eve party or in front of a New Year’s Day football game. I’ve been having fun playing with my air fryer–I even created a group on Facebook for all of us FatFree Vegan Air Fryers. But don’t feel left out if you don’t have one. Simply roast the black-eyed peas in a preheated oven on a parchment-lined baking sheet. See the notes at the end of the recipe for suggested time and temperature. 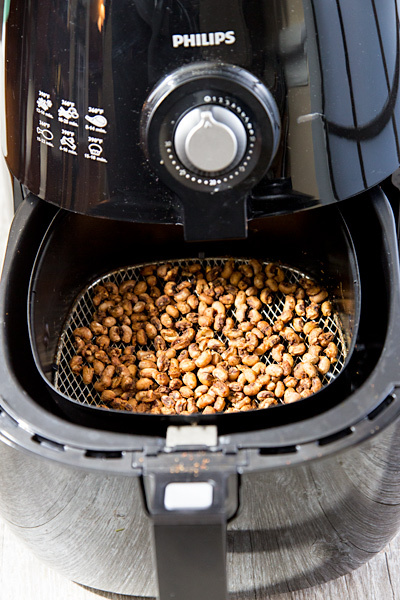 The air fryer makes this black-eyed pea snack crunchy in minutes, but you can also make them in an oven or toaster oven. See the notes below. The recipe depends on having firm, intact black-eyed peas, so if yours are mushy and falling apart, save them for another use. Preheat your air fryer to 350-360 F. Put the peas in the basket and air fry for 5 minutes. Remove the basket and shake or stir to redistribute the peas. Air fry for another 5 minutes or until peas are crunchy on the outside and slightly tender on the inside. Allow to cool and serve immediately. Note: these get soft quickly, so try to serve them as close as possible to air-frying or reheat for a minute or two in the air fryer or oven just before serving. You can make these in the oven or toaster oven. Preheat oven to 400F. Spread the peas on a baking sheet lined with parchment paper or silicone mat. Bake until they are crunchy, stirring after 8 minutes. 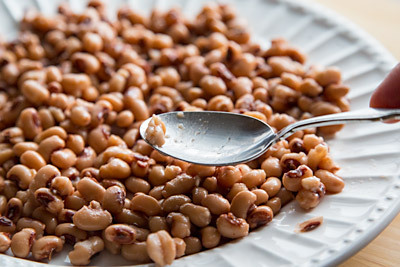 Sodium listed in nutritional info assumes black-eyed peas cooked with salt and the optional salt in the seasoning mix. I wish you all a happy, healthy 2017! Happy New Year, Susan! I love black eyed peas and these looks tasty. Other than length of time, is there a difference between air frying and dehydrating? I think the big difference is the high heat of the air fryer gets things crispy, while a dehydrator would just dry them out–and take a very long time. The air fryer is generally quicker than an oven. I was wondering about using the dehydrator method also!! 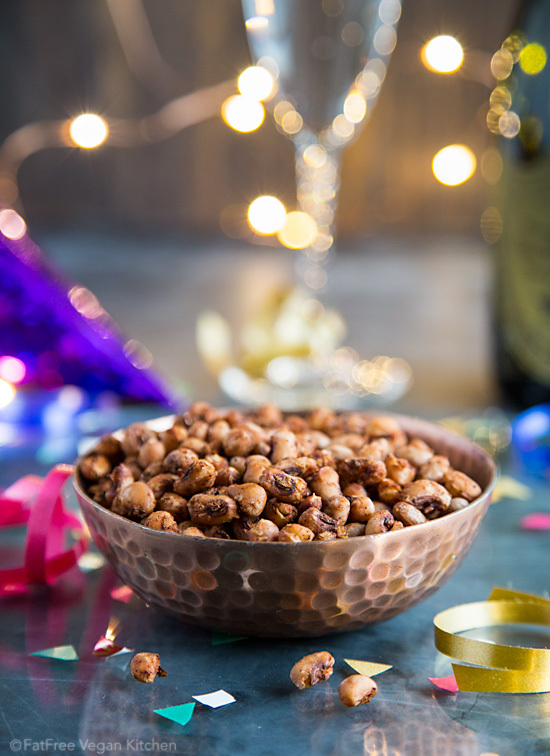 Happy New Year and these look wonderful – such a fun and healthy snack idea. Thanks! Happy New Year. Can’t wait to try these. Looks delicious. I’m going to also a batch with the dehydrator for the “cooking” process. 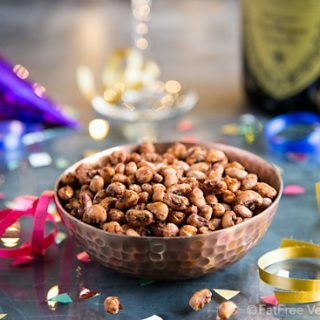 Black Eye Peas are a stple for the New Year. Thank you for posting and love the site. I read that air fryers actually ask you to use some oil. Not the case??? Thanks! Great idea! So, now instead of snacking unhealthy things, I will try this healthy and tasty snack.